Create practically perfect, customer-designed organizers for all your unique stuff – built to your exact specifications with our easy-to-use online design tool. Start your design from scratch or use one of our templates to create the perfect solution. 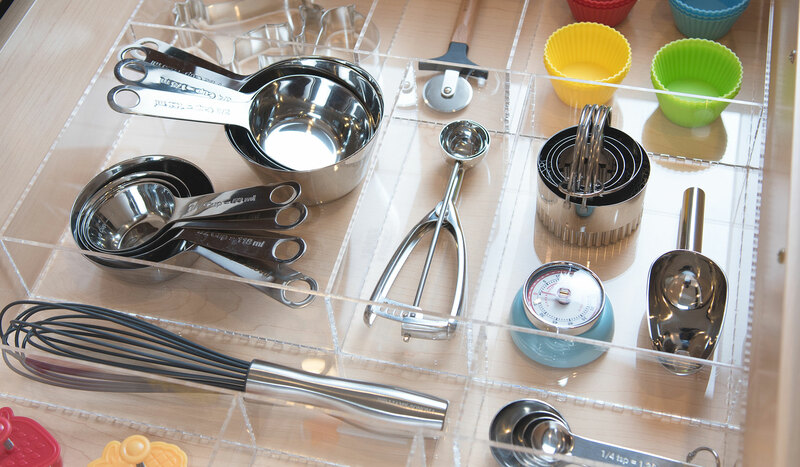 Our patented organizers are built using 1/8-inch clear acrylic to achieve a modern look and a perfect fit. Your organizers arrive fully assembled so you can start enjoying custom organization right away. Add our luxurious fabric liners to beautify your organizer even more. Don’t stop decorating at paint and furniture – make your drawers and shelves as complementary to your décor as your favorite throw pillow! Surprisingly Simple. Remarkably Fast. It's that Easy! Watch a couple of our customers share their experience using our product. Deliver peace and custom organization to your customers. Now, you can quickly and easily design precision-crafted organizers online - built to your customers' unique needs and specifications. Stand out in your space. Upgrade with ease. Drive sales. And boost revenue. Monday-Thursday 8:00AM - 5:00PM Mountain Time. CLOSED Friday, Saturday & Sunday. We observe the following holidays : New Year's Day; Memorial Day; Independence Day; Labor Day; Veterans Day; Thanksgiving Day and after; Christmas Day and day after.